Researchers led by Dr. James C. Culver from Baylor College of Medicine in Texas used Imaris to better understand vessel morphology and physiology in the subependymal zone, an important area for forming new neurons in the adult brain. (A) To analyze the vessel structure in the neural stem cell niche, the researchers focused on the anterior (shaded) region of the subependymal zone (SEZ) where the density of neural stem cells is highest. (B) They labeled the microvessels in the anterior SEZ with an intracardial injection of fluorescent tetramethylrhodamine-labeled dextran (TMR-Dextran) and imaged en-face. (C-D) Vessel segments were traced using image processing software and color-coded according to distance from the ependymal wall (SEZ = 0-20 μm; striatum > 20 μm). Vessels are shown both en-face (C) and from the side (D). The researchers used these traced vessel segments to make morphometric measurements of vessels in each vascular domain. Image reprinted from PLoS ONE, Vol 8, Issue 1, e53546. The microenvironment of the subependymal zone is essential for regulating neural stem cell maintenance and division throughout adult life. Although other studies have shown that blood vessels in this zone are important regulators of neurogenesis, the mechanisms involved are not completely understood. To learn more about vessel morphology and blood flow, the researchers conducted a three dimensional analysis of the mouse subependymal zone. 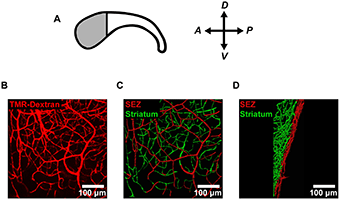 The investigators acquired confocal microscopy images, to which they applied the Imaris FilamentTracer function to determine the three-dimensional coordinates of branching microvascular networks in the subependymal zone and striatum. They then used a custom-written ImarisXT add-on to make morphometric measurements from these data. The morphological analysis revealed that the vessels in the subependymal zone and underlying striatum naturally subdivide into distinct microvascular domains that have unique vessel densities, tortuosities, and orientations. Dr. Culver says that this site-specific specialization may play a role in regulating blood flow, hemodynamics, and potentially cell-signaling in the subependymal zone. (A-B) To measure regional blood flow, the researchers imaged microspheres deposited in SEZ flatmounts. DAPI (A) was used to locate the surface of the ependymal wall for determining microsphere depths. These data were used to calculate regional blood flow rates by normalizing microsphere counts in each region of tissue to a reference sample of known flow rate. Image reprinted from PLoS ONE, Vol 8, Issue 1, e53546. To measure regional blood flow rates, the researchers injected microspheres into the circulation of adult mice, and then used the Imaris spot detection function to identify the 3D coordinates of microspheres that became lodged in capillaries in the subependymal zone. The automated spot detection was crucial because it precisely located the microspheres and let the investigators handle the large amounts of image data required for this analysis. The spot detection analysis revealed that the subependymal zone exhibits low rates of regional blood flow. Dr. Culver says that low blood flow and hypoxia have been implicated as potential regulators of stem cell maintenance in the subependymal zone, but until now, blood flow had not been successfully measured in this region. Research Paper: Culver JC, Vadakkan TJ, Dickinson ME (2013) A Specialized Microvascular Domain in the Mouse Neural Stem Cell Niche. PLoS ONE 8(1): e53546.doi:10.1371/journal.pone.0053546.